The National Lancers with the Reviewing Officers on the Boston Common. 1837. Charles Hubbard, American, 1801–1876. Lithograph, hand-colored. Museum of Fine Arts, Boston. And there is an article on Wikipedia. 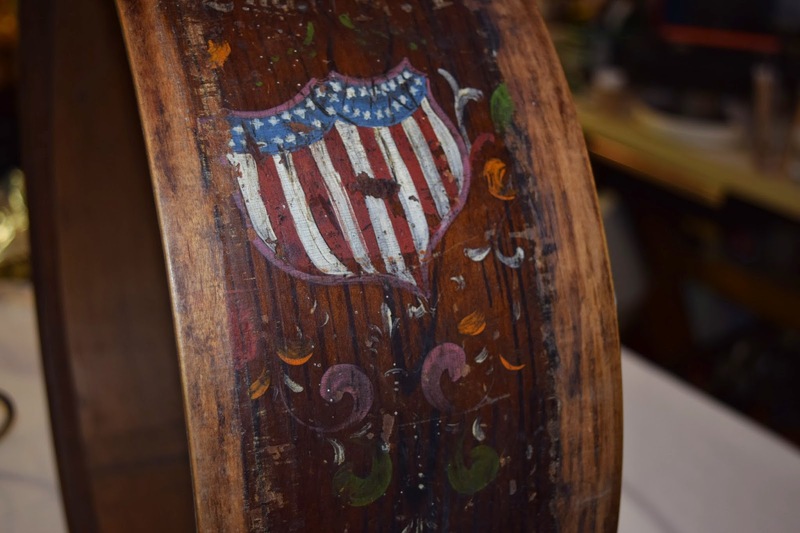 A reader emailed saying that he'd been asked to restore this Civil War era drum for a local historical association. The drum carries a label "H. Deming" of Ohio. "I just returned from Cooperman up in Bellows Falls, VT. I spent the PM of the 22nd working with Jim Ellis, and we made major progress toward an appropriate restoration. "The drum came to me with two sets of rope hooks(of 3 mixed designs, including a carry hook); snare strainer with wire snares, one skin head mounted to one flesh hoop (punctured & badly warped), the other flesh hoop (broken & distorted, but no skin), heart-shaped leather ears (each stamped twice with a circular star design), and two different styles of threaded metal tensioners. "The drum now has two new flesh hoops and Pakistani goat skins (the extant pcs. will be archived), and I am now about to add some minor finishing touches. We restored it as a rope-tension drum despite its rather short stature (to utilize the leather ears); both sets of metal tensioners--perhaps one or both used in later modifications of the drum--will also be archived. "There is a brass grommet that fits the vent hole, though I think bone might have been more often used for this purpose." I wrote: "There is a restorer's wood cleaning product called "What I Use". 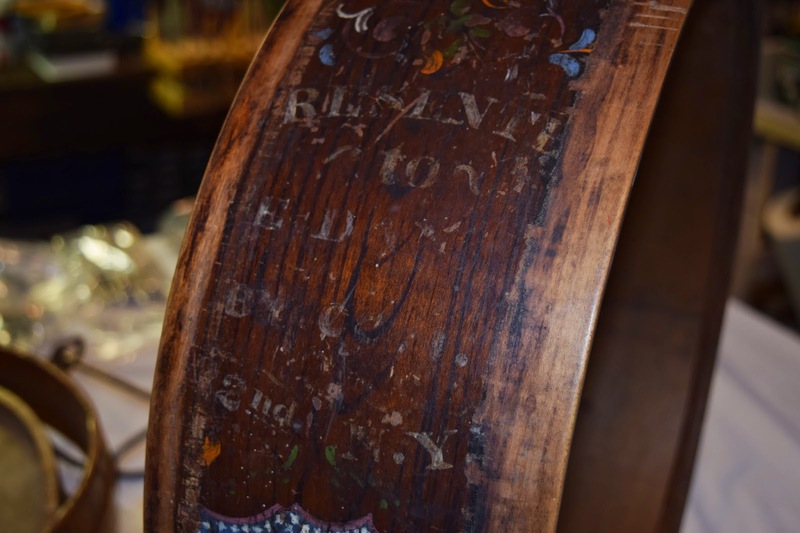 I've used it on old, dried out wood drums with much success." See http://www.whatiuse.com. He replied: "Thanks, hadn't heard of this product. But, I never use any oil-based cleaning product on anything of value; the oil component always darkens with oxidation over time. It is very difficult (actually, nearly impossible) to safely remove or rejuvenate in the future. For general cleaning, I most often use an alkaline soap named Vulpex, in only a 1-2% conc. solution. It is miscible in both water and mineral spirits, and rinses cleanly. Then, all I do is apply a paste wax (or, if the finish is real bad, a mineral spirits soluble varnish such as Gamar Picture Varnish (see link, below). http://www.gamblincolors.com/varnishes/index.html"